Bleach 516 has to the one of the best reveals ever, the awesome 0 Division has appeared and it’s impossible to think that only 5 members are needed within such an important and crazy team, they being the strongest who are all more powerful than all of Soul Society and Gotei 13! We also find out more information on what happened to Ichigo’s Zanpakutou. 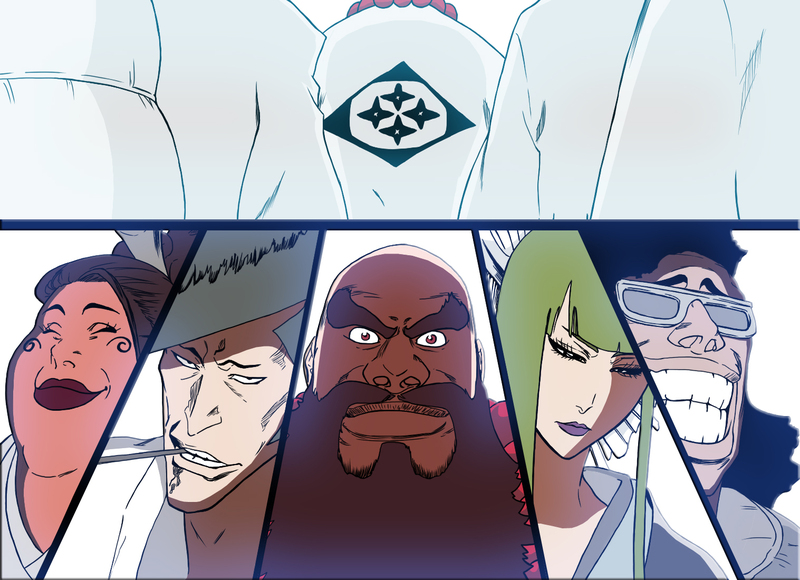 Bleach 516 starts somewhere where there are multiple pillars where a person tells these officers with new tags on their cloak that everyone is ready. Ichigo reaches Mayrui’s lab, he notices that his sword still isn’t fixed. Ichigo brings up that Mayuri had previously repaired his sword, Mayuri corrects him telling him that he had modified it. In order to repair a Zanpakutou, the owner needs the Reishi and Reiatsu, which they need to merge them into their Zanpakutou, it’s simple. Ichigo starts talking when Mayuri stops him. He tells him that it only applies if the Zanpakutou was broken in its Shikai phase, but if it was a Bankai then it would be a lot different! 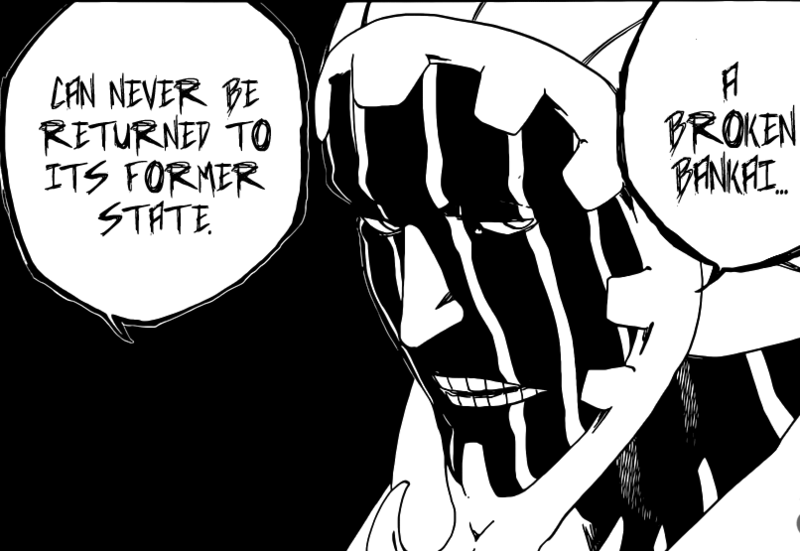 Mayuri reveals that a Broken Bankai can never be returned to its former state. Mayuri reveals that there are some exceptions like Komamura because his Bankai is different. Madarame’s Bankai was previously destroyed, and now it’s not even a fraction of what it used to be. Ichigo asks about Renji’s, Mayuri states that his Bankai was destroyed by Byakuya, now since it was his Bankai, it was never repaired because of how hard it is, and thus Renji’s Bankai remains broken since their last encounter. Someone large appears, it seems that Kon has finally appeared! 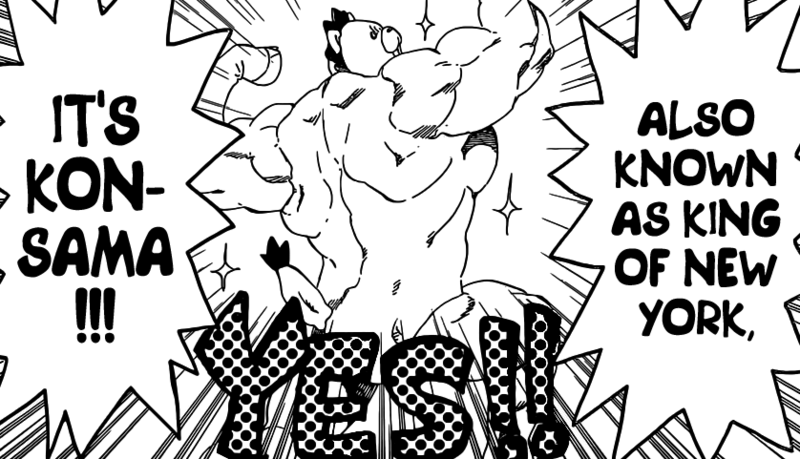 Ichigo asks who they are, Kon introduces himself as strong and King of New York! Mayuri watches as Kon went from being large to small, Mayuri says that it was interesting to what just happened. Mayuri receives a message, he clicks his head and hears the message, he reveals that the Zero Division has arrived! Somewhere else, all the Captains are standing there. Ichigo runs towards all of them, Ichigo asks Shinji who the Zero Division and where they are staying. Shinji tells him that they live with the Spirit King in the Royal Palace. Shunsui reminds Ichigo of how he arrived, the wall never used to be up, it was only up during an emergency like now. They quickly arrive from a large pillar like object in the sky. 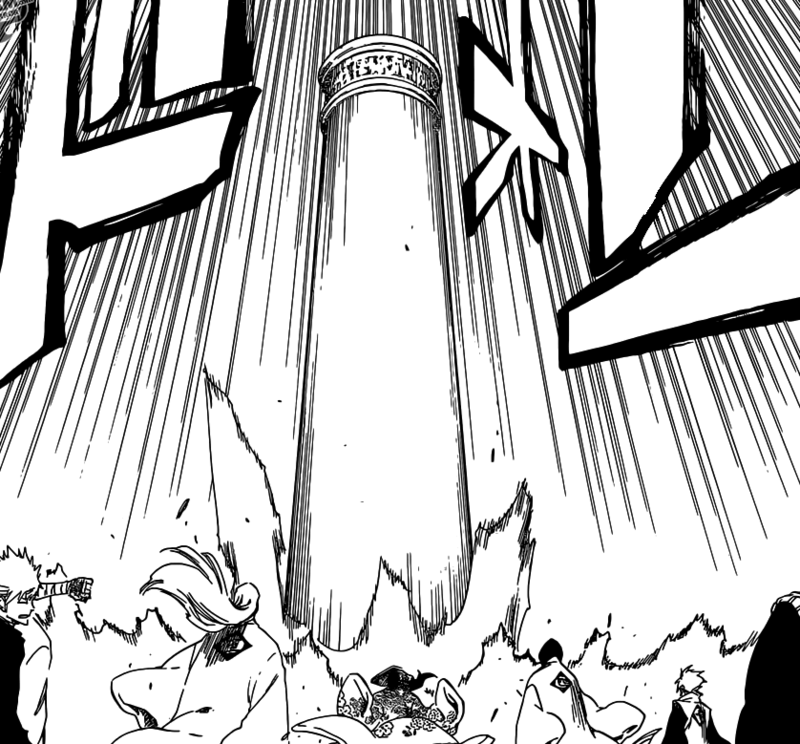 Ichigo notices that this is a Tenchuuren (Literally Meaning Heavenly Pillar). They use it as their preferred method of Transportation by the Zero Division. Everyone from the Zero Division is inside that pillar, Ichigo asks if they aren’t cramped in that space. Shunsui reveals that there is no soldiers in the Zero Division, also calling them all Captains wouldn’t mean a lot. Shunsui also reveals that their combined power is greater than all of the Gotei 13 all together! The 5 Amazing members finally appear! A man with glasses, a woman who looks like she’s full of regret, a large man with a large beard, a skinny man with something in his mouth. A large woman who looks cheerful! Bleach 516 ends here! A great chapter where we finally lay out eyes on the fantastic Five great members of the Zero Division! What a great and awesome chapter! They all look fantastically powerful, but still look pretty calm! Can’t wait to see what they’ve got, can’t wait for next week’s Bleach 517! i’m not the only One here who Bet that Nice looking Lady (With Black Hair) from the Right Side is ” Kirio Hikifune ” right ? This “broken Bankai” thing is weird. Renji used his Bankai numerous times after his fight with Byakuya and I don’t rememeber any of the blades looking different than the others(i.e. broken), maybe I didn’t pay attention to this though. Still, Mayuri says he modified his Zanpakutou, seems legit, his Bankai got busted twice and nothing changed in neither it’s appearance or power. Well, as it looks now we’ll definitely see Ichigo talking with Tensa Zangetsu in a few chapters and the way he’s going to fix his Bankai may turn out to increase his power even more. Haha it would be a shame to stray from the archetype of Bleach at this point in the story wouldn’t it? It definitely would be, I hate it when authors break rules they set themselves. Zero Division is here…they sound tough, but I hope that Shunsei is either exaggerating or underestimating the captains. I mean, these 5 beating the 13 Captains?…..I’m not so sure about that. Especially if we’re counting Yamamoto. At least this proves that the Soul King isn’t figurative. Still, I wonder when he’ll appear, and why he doesn’t care that Soul Society was pwned..then again, Squad Zero doesn’t seem to care much either. I’d love it if it ended that way! I already think that Ichigo is far stronger than all of the Captains, but the author hasn’t fully confirmed it yet. I want to see them show that he’s the absolute strongest Bleach character. Plus, he needs to destroy or beats the Soul King. I don’t want that guy making it through this arc in one piece. I’d say the 1st lady who looks all happy is Hikifune. She looks more of the mother figure type as described by Hiyori. I really don’t see the angry Hiyori getting along with the pretty female on the right side. She does look like she is from some noble family though. Probably she could have been the predecessor to Yourichi. If I am right about the fat one being Hikifune, I think we’ll see Shinji getting a huge bear hug from her cause I’m pretty sure Shinji was in good terms with her as well cause of Hiyori. I have a feeling that the middle, bearded person, is a younger brother of Yamamoto. Put a cross scar on his forehead and imagine a white beard instead of the black one and we get a slighty younger version of the old Yamamoto. I have a feeling that the 2nd member from left with the thing in his mouth is gonna be an idiot who looks down at others. He does have THAT look to his face. About Ichigo’s bankai, I guess he will need to have talk with zangetsu. My guess is that, he will find Zangetsu injured. Probably without a limb or something. He might then go to his dad for advice and that time will learn more about his mom. And also, since he will have a weaker bankai, he will need to learn some new quincy moves. What you mentioned about Ichigo going to see his father could be something that could become reality.. he will need to eventually go and see Isshin for advice and such.. eventually ask about Ichigo’s past and his mother too..
Hiyori is alive. She was shown in the beginning of this arc carrying a basket. was shunsei serious about the total power of the 0 zero surpass the 13 division, so that means that there even stronger than yamamoto. On an individual basis I would say that Yamamoto was the strongest, that’s why he was the Captain Commander. When fighting Aizen he said that in the last tousand years no Shinigami stronger than him was born. They don’t look older than Yama-ji so it would make them inferior to Yamamoto. About the total power I believe Shunsui was serious, just look at all the Shinigami below Vice-Captain level, if the 0 Squad members are close to Yamamoto’s power level their combined strength would indeed be higher than this of Gotei 13. It’s not necessary that individually they need to be stronger than Yamamoto. They are probably around Aizen’s level if not a lil higher. Aizen alone took out most of the captains on his own. So the zero squad, assuming they are of his strength level, can easily be much more powerful than the 13 divisions combined. Yes, Yamamoto had the Most powerful Fire Zanpakutou, but there are always other powers which are stronger than fire..
if what shunsei say is true about the zero division being that strong, then that means back then aizen was as strong or maybe stronger than the zero division since he beat most of the captains just like that. He did show his bankai you moron. Were your eyes getting gouged out when readind juha vs yama or something? Technically, Aizen beat them because of his ability. I’d say Aizen is on Kyoruku’s level or a little higher without his zanpaktou’s abilities. Kyoruku took out Stark without any trouble. Stark even states “why does he have to fight someone so strong?” Kyoruku was way too powerful for Stark. Aizen is strong but I doubt he is stronger than the zero division. He probably would be a part of the zero division if he wasn’t evil.